You know what's frustrating? When we celebrate a store moving across the street, especially when the old store is only twenty years old, not obsolete, and the anchor of a shopping center which has already been hurting for business. 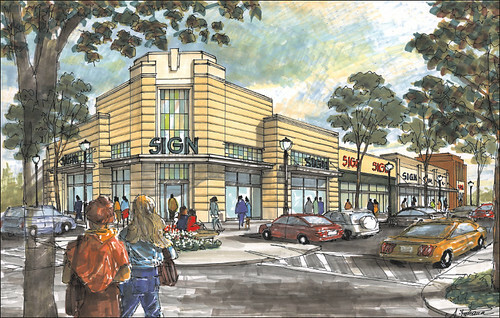 Rendering of Burtonsville Town Square. "I'd like to say thank you Giant for helping the turnaround of our East County area," said newly elected State Senator Karen Montgomery (D-Dist. 14), whose district includes Burtonsville and Colesville. "This is wonderful and it's just the beginning." Eric Luedtke, who was elected one of three Maryland General Assembly delegates for District 14, echoed the thanks while including a message about area infrastructure. "I hope this is the first step in revitalization here in Burtonsville," Luedtke began. "In order to do that we're going to need to take the first step of fixing [Route] 198 out here." I love Karen Montgomery and Eric Luedtke, both of whom have kept JUTP well-fed and guest-blogged over the past four years, and I'm confident in their commitment to the revitalization of Burtonsville. But I'm disappointed by their enthusiasm for something which is definitely not progress! In fact, it's a pretty mediocre accomplishment, not unlike moving Choice Hotels from White Oak to Rockville. We're supposed to create jobs and amenities here, not play musical chairs with them. And furthermore, how will moving Giant across the street help revitalize Burtonsville? Will it prevent shoppers from traveling one exit north to Maple Lawn? Will it fill the empty tables in Seibel's, Soretti's and the other awesome places on Route 198's "Restaurant Row"? No, it won't, because when everything is said and done Burtonsville will have nothing more than it did a few years ago. Except for the Amish Market, of course. It still makes me angry to realize that a developer could kick that local landmark out of town and a move stores from one side of the street to a giant strip mall that goes against everything a "small town" like Burtonsville should be and people in this community have rolled over and accepted it. Burtonsville Town Square was an opportunity to create an actual catalyst for Burtonsville's revitalization; instead, we'll have more empty storefronts, more empty parking lots, and more empty promises. Special thanks to Whitney at Colesville Patch for linking to me in her article. Keep up the good work! I'm not up that way very often any more, but just from casually driving through, it seems like the biggest problem is that the intersection is so unfriendly for local traffic. And old Route 29 north of 198 does not need to be that big anymore. Maybe it doesn't even need to be there at all. It would be cool if they had a smaller road for the local traffic and did something to combine the two shopping areas. That shopping center where the Giant used to be is going to die now. And I hate to say something in favor of the ICC, but maybe after it gets finished, they could make 198 into less of a thoroughfare and into more of a "main street" type of road. I hope there's enough community spirit there in Burtonsville for actual improvements to eventually happen. Thanks so much for the compliment and linkage! I live right on the Laurel/Burtonsville border and I have to say that this blog hit the nail on the head! Let's face it, the Dutch Country Market was the signature of Burtonsville, it was the only reason people in the surrounding areas came to Burtonsville, now its in P.G. county (down the street but no less in P.G. county) and P.G. already has a Dutch Country Market in Upper Marlboro! The parking at the Laurel Amish market is a NIGHTMARE! People have to park in other parking lots whereas the new shopping center at burtonsville has a now empty, LARGER parking lot. With this economic slowdown, I don't understand why they didnt just re-vamp the old shopping center, keeping the same tennants, and then Revamp burtonsville crossing, KEEPING THE SAME TENNANTS including Giant with a make over on the same property. This is similar to moving the SILVER SPRING LIBRARY a few blocks away. MADNESS PEOPLE! I have not been to the Amish market since they moved. I suffer from mobility ptoblems and have a disabilty parking permit--however- there never seems to be enough spaces so I gave up after two attempts. At the old location, even if there was not any available disability spaces, I still managed to find a space close enugh so I would not have to walk so far. The new store is beautiful, but the old shopping center is sad. One by one the stores are dropping. It's hard because there are so many shopping centers so close by. Personally I wish they would put a book store in, that's something that is not on Tech Road or Maple Lawn. A Satellite Campus for MC or UMD would be good too, but I'm not sure what that would entail. I've been hoping the Post Office could take a place in Burtonsville Crossing. It is sad to see the shops closing up.